A gecko called...three times in succession. We sat motionless on the black marble veranda, still cool from the evening chill that lingers in clear mountain air yet to be warmed by the morning's rising sun. Slowly two elaborately carved gild doors opened a crack...then a bit more...stopping somewhere between not quite closed but not wide open either as if suggesting an ambiguous welcome to our presence through a small portal or a limited visual perspective. Inside the pale coral, brick structure, it was totally dark except for a small flame brazier casting a dim yellow light in front of a stone sculpture carved as an elaborately attired human figure with an elephant head and four outstretched arms. 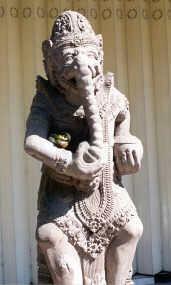 I recognized the sculpture as Ganesha, the beloved Balinese god whose presence is invoked to remove obstacles hindering success in any major undertaking, especially those requiring wisdom, understanding as well as protection. From the darkness two hands emerged and carefully placed a garland of fresh, white flowers around the neck of the Ganesha, delicately arranging each blossom with care and tenderness. The same hands, moving fingers in a graceful circular dance, spread something small, but indefinable into the brazier. The flame flickered brightly for a moment, danced blue, pirouetted red, then faded yellow once again. Smoke wafted lazily in front of the Ganesha, swirled in ringlets through the gilt doors carrying a sumptuous, spicy aroma out onto the veranda. Sandalwood. Again the hands spread something into the brazier. Then again, for the third time. The aromatic smoke grew thicker, denser. Sounds from a dynamic baritone voice trembled in vibrato crescendos, like primordial rhythms originating deep within a underground cave bubbling up toward the surface. The sounds echoed within the smoke-filled darkness behind the gilt doors and seeped onto the veranda whirling around us like a living, vibrating haze. Although the words, the prayers, the mantras were unintelligible to me, the powers of their invocation, the force of their intonation, were clearly potent, unmistakably vociferous. Mesmerized by the rhapsodies of the baritone voice, encased in thick fragrant essences, we sat...we watched...we listened. From somewhere nearby, a rooster crowed, dogs barked, ducks quacked, and a pig grunted. The baritone voice rolled on in continual motion with bravado undaunted by the animal's cacophonous accompaniment. With eyes of an artist forever enchanted with colors and forms, I feasted on the vision of the two doors, gilded richly in gold from top to bottom, ornately carved with swirling lotus blossoms, cascading leaves and undulating ferns. They glimmered and glistened in the soft rays of an early morning sun. For all their splendor, the doors were slightly shorter and narrower than ordinary doors. Black marbles steps led up to the doors, also slightly narrower than ordinary stairs. To either side of the small staircase, twin stone sculptures, half-animal, half-human, fierce in demeanor, poised with weapons raised threateningly above their wildly coifed heads, ready to strike. They both sported fresh red hibiscus blossoms placed jauntily behind their ears. Far more than an ordinary structure; this was a sacred building, a holy shrine, a sanctified edifice. The baritone voice inside it was not ordinary either, for me, it was almost otherworldly and unlike anything I had ever heard before. It's shrill shrieks reverberated in ricocheting vibrations so loud; I shuddered for a moment and looked up. 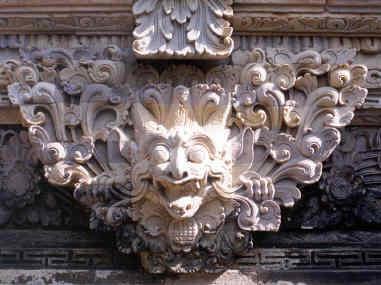 Above the gilt doors, was an enormous stone lintel carved into a ferocious demonic head that bared stiletto fangs; that peered viciously through grotesque bulging eyes, its stone talons permanently dug into the corners of the two gilt doors it guarded below. Forever silent, it's unheard animal screech in concert with the rooster, in syncopation with the baritone voice but in some other dimension, some other time. Smoke continued to swirl out through the doors, now rising upward with a lumbering heaviness like velvet curtains ascending to expose a stage. I watched it climb around carved limestone panels that depicted scenes of elaborately attired, serenely poised human figures, with impassive but vaguely peaceful expressions, their lavish curves contrast with the smooth, pale coral brick of the exterior. 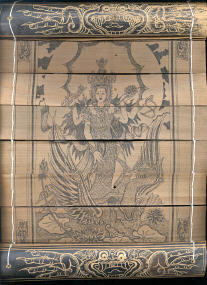 The smoke rose at length to the uppermost point of a high, polished bamboo ceiling, where a mythical garuda bird with outstretched wings perched. Each hair of its feathers carved with intricate detail out of a delicate honey-colored wood, its long formidable beak open, ready to emit a deafening, piercing screech in response to the demon head above the door, ready to answer, in its own silent way, the rooster and the baritone voice. My eyes followed the smoke flow out to carved gild posts at the edge of the veranda, where it wrapped around coiling serpents, slithering dragons, grazing geckos, all emerging from a stout elephant head at the post's base. Like totem poles given life from the wood, through the most precise, carved, rendering of minute detail, these mythical creatures projected stoic sounds of silence toward the roosters, dogs, ducks, pig, and the baritone voice. Somehow, the splendor of lustrous marble, polished woods, gold leaf and stone sculptures seemed incongruous with farm animals pattering about barking, crowing, quacking and grunting. Incongruous, that is, only to me, a foreigner from America, but certainly not to my five Balinese friends sitting behind me on the veranda, nor to the Balinese man whose baritone voice held us captivated. For on that morning I was in Bali, a land where time and reality stretch beyond the dimensions of the physical senses, refracts into an ever changing kaleidoscope that grants the privilege of its existence to those who possess the power and knowledge of mystical keys that unlock secret passageways between dimensions. A land where the world that can be verified by intellect, sight, sound, taste, smell or touch exists in a dimension the Balinese call Sekala. A land where the simultaneous existence of another separate dimension, Niskala, is considered every bit as real, every bit as dynamic as Sekala but beyond the world measurable by either the intellect or the senses. A land where I choose to live for the next year and a half. A land where Niskala is accessible, sometimes, by some humans ... perhaps someday even me, I hoped. But I knew even then that Niskala, like its opposite counterpart, Sekala, contains within its dimension, many opposites. Thus, good and bad in Niskala. Good and bad in Sekala, too. Balance; however precarious or minute it may, be is fluid, ever changing and sought as ideal. The gild doors opened wide, a figure shrouded in smoke emerged, crouched slightly to pass through the doors, and then stepped down onto the veranda. As befitting a man who possessed a powerful voice, he was slightly barrel chested, stocky but muscular and stood before us with the alert stance of a general surveying his troops. Barefoot and draped in a lustrous white sarong that had an ornate design woven into the cloth with pure gold strands. Tied around his waist was a floor length crimson sash with a similar gold weave. His impeccably tailored white jacket was ornamented with onyx studded, gold buttons and an array of tiny gold pins and gemstone brooches were pinned onto his chest. Around his head he wore the traditional Balinese white headband, tied in front with a triangular edge pointing skyward, but his was edged in gold. His thick, pitch-black hair grazed the bottom of his neck and he wore a fresh red flower behind one ear, a white flower behind the other and scattered flowers on top of his head. Pieces of rice were stuck to the middle of his forehead and at his temples. His attire was basically the traditional one Balinese men donned when going to a temple. My five friends on the veranda were dressed in a similar fashion, but his materials were opulent, they were the materials of a distinguished man of great wealth. Altogether, he was an awesome, impressive presence. This was Jero Gede, the man behind the baritone voice. I tried not to stare openly. He placed his hands together at his chest, then bowed his head in greeting to us. We did the same. He looked straight into my eyes for a moment and the face that initially bore the distant formality of a general, softened into the demeanor of a beloved friend with eyes that exuded the tenderness of a father, a brother, a favorite uncle or all the above interchangeably. He smiled broadly then began speaking to me rapidly in Balinese. When he finished speaking, my friend Nyoman Wijana answered him in Balinese. I only recognized a few scattered words during his narrative...America, Dona (the Balinese pronunciation of my name), meditation, guru, prayers, temples, and ancestors. I watched the man's reactions during the narrative as they shifted between expressions of curiosity, surprise, approval, and additional exchanges of conversation that occurred between the two men. Nyoman became silent, the man walked across the veranda, sat down cross-legged directly in front of me and grasped both of my hands. I looked down...his hands did not seem to match the structure of his body. They were as beautiful as a young woman's but still most definitely masculine, smooth skinned with extremely long, slender fingers, two large ornate gold jeweled rings on each hand, and very, very long, shapely fingernails. Behind me Nyoman spoke in English. Not only did he have an excellent grasp of the language, he possessed the rare ability to translate both Balinese and English simultaneously throughout conversations with relative speed and accuracy. He always substituted the pronoun "we" instead of "I," it seemed to be his way of remaining humble by not drawing attention to himself, as if releasing his ego by eliminating "I" in his speech, might also release it within his heart and mind. It was a subtle mannerism to habitually push his awareness beyond himself into the collective mind. He spoke in somewhat a hushed tone as if the sounds of foreign words might transform into more pleasant, more acceptable tones in this sacred area as well as to the ears of Jero Gede. "Dona, we told Jero Gede that you came to Bali for the first time three years go because you were very interested in following the spiritual traditions and practices of Bali. We first met at the temple Tirta Empul where we invited you to participate the following evening at the opening celebration of the Odalon ceremony. That night under the full moon, the temple priest invited you to enter the sacred waters in the temple pools for a purification ceremony at midnight followed by meditation and his blessing. You came to Bali again last year, lived with my family for three weeks and we journeyed to all of Bali's most sacred directional temples. We mentioned briefly to him some of the important incidents that occurred to you during that time especially at the temple honoring the ancestors at Lempuyan and at the temple Rambut Siwi. We also explained to him what happened between you and Guru Wayan Redon at your first meeting as well as how he recognized you from the things his own Guru foretold many years ago. Now, on your third visit to Bali, you plan to intensify all your meditation practices and further your study of Balinese spirituality. 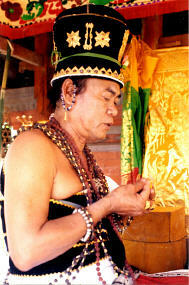 Guru Wayan has invited you to study and live with him and his wife in the mountains north of Negara. Until their house is completed for you in three weeks you will live with my family." Still holding my hands firmly, Jero Gede and Nyoman conversed back and forth once more in Balinese. Nyoman translated, "Jero Gede asked about your meditation and spiritual practice in America. We told him you began meditating twenty years ago and have studied Tibetan Buddhism with your American guru, Dr. Grotte and also the ancient African ways with your African priest, Baba. He then asked about your job in America and we told him you painted pictures for the largest American bank on a computer. You worked there for many years but quit your job to come to Bali." I smiled and thought inwardly, that I never could really explain to my Balinese friends what a corporate graphic designer at the Federal Reserve Bank really is, but it did not really matter as the Fed seemed another life time ago to me. And inconsequential at that. Jero Gede quipped something to Nyoman and hilarious laughter rose from all of the men. Nyoman still grinning replied, "Permit us to say Dona... Jero Gede thinks you are an intelligent, serious woman, he also thinks you are very pretty. Excuse us for boldness of speech, we do not wish to alarm or offend you, but he also said he would marry you right now but can not because he already has four wives and they are more than enough for him to handle. Also it is better for you not to be married while you are on a spiritual journey. It is much too distracting for meditation to have a husband kissing you and chasing you all the time." I would rather be distracted by a husband than a wild barking dog," I flippantly remarked. As if I had tickled their tummies, another fresh round of chuckling and jostling circled through the group after my words were conveyed in Balinese. Mentally reminding myself that I was the foreigner in this culture, I continued, "Surely, a distinguished, handsome man like Jero Gede who also lives his life in harmony with the Dewas (gods), keeps each of his wives delightfully happy." He gave my hands a little squeeze, laughter still sparkling in his eyes. I didn't say that he could never in a million years get away with four wives in America, nor would American women ever agree to share their kitchens let alone their men, myself included...but this also was a part of Bali. If a man could properly afford more than one wife, and he choose to marry another, and most importantly, he was able to convince his other wife or wives to agree, in a formal written document of course, then it was a perfectly acceptable family arrangement. A rounder's paradise. The practice is actually not that common any longer, especially among the younger Balinese generation. Moreover, I thought, here we were at this moment, joking and laughing while not more than ten minutes ago, Jero Gede was inside the sacred temple with sandalwood incense pouring all over the place while he invoked the Dewas (gods) mesmerizing all of us with his baritone voice. This is Bali also. There is a time for the gods and and a time for joking and laughter, too much of one or the other was a foolish way to live. Balance, I reflected was always at play. The jovial atmosphere calmed down a bit and a more serious one was exchanged between Jero Gede and Nyoman. 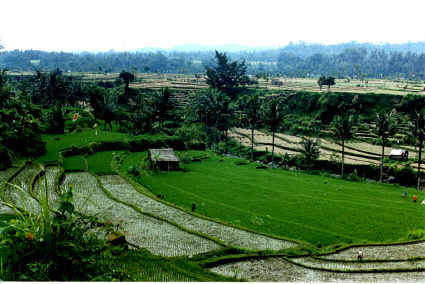 Finally Nyoman spoke to me, "Dona, we have told Jero Gede that you are honored to have the opportunity to meet with him and have fasted for three days in preparation for this visit with him today because you are very much aware of purifying the internal body as a means of cleansing the mind and spirit. You know all are connected. We also explained to him that you have come to see him for two reasons. First, to check on your health to be sure that everything in your body is good and is ready for this journey. Second, that you wish with all your heart, and with honor, to conduct a tribute to your ancestors and you would like to perform the ceremonies in the Balinese tradition. We explained to him that Americans can not trace their ancestry like we can through many, many centuries but perhaps Jero Gede can communicate with your ancestors to find out what they would like you to do for them. Jero Gede has agreed to do this for you. Okay Dona?" I thanked Jero Gede in Indonesian, and he rose, walking back into the temple with the stride of a man in confident command of his territory. Nyoman leaned forward and whispered to me, "Dona, we did not talk to him at all about the ruby jewel. Remember what we said last night, he doesn't always give it to people, it just depends on what he sees and what the Dewas tell him. He gave it to us right away on my first visit with him long ago. Made Swaspoda and Made Kumara also received it right away. Made Lame and Made Suardana had to study and visit with him a long time before they got it. Other friends tell us the same thing. We are not sure he has ever given it to a foreigner; most of them come to see him for healing sickness not for that kind of thing. But please, my friend, do not be disappointed if he does not give it to you. Okay?" "Yes, Nyoman, I understand" I replied. He then turned to the men, Made Swaspoda, Made Kumara, Made Lame and Made Suardana explaining to them what he had just relayed to me. All five men looked at me with genuine tenderness in their eyes, smiled and shook their heads in agreement. As if the combined understanding and strength of five men, like brothers around me would stand solid as buffers against anything that might harm me or even disturb my feelings in the smallest manner. From the very first time, a year ago, that they traveled with me as a group, these five men assumed this role as protectors. That role never changed throughout all our journeys that year. On this morning once again, they came with me as active participants. I briefly thought about the conversation we shared the night before. 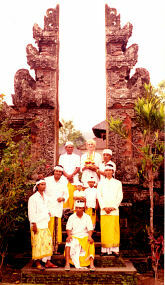 The men explained that Jero Gede was a very famous well-known and respected balian throughout all of Bali. A balian is a person, male or female, who is believed to possess supernatural powers of varying sorts. Some cure sickness or prevent it, some predict future events, some explain current misfortunes and offer remedies, some were able to trace family lineage, some were able to help create good fortunes, and some were able to cleanse negativities within a home or land. Conversely, all had the capacity to use their powers for vile, even evil actions if they so choose. There were a few who did choose that direction, even though it was considered extremely dangerous and ultimately carried the possibility of driving the balian crazy. 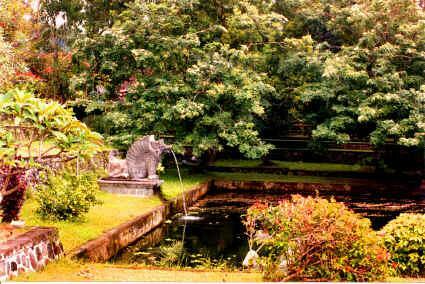 Balians were not necessarily pemenku (temple) priests or pedanda (high priests), but could be either. Jero Gede was not a priest of any sort; rather he was a very wealthy man who was given the blessing of these powers after a long illness in which he almost died. Afterward, he devoted himself to helping people cure illnesses but was particularly sought in reference to ancestor lineage. He never charged for his services. He also conducted monthly studies sharing his knowledge of the esoteric and mystical arts with his students. My friends studied often with him. The baritone voice began once again...this time somehow sweeter softer more like a lover beckoning his beloved. The sandalwood smoke began drifting out of the gild doors once again. All the animals were quiet. I almost thought I heard the sound of the sea lapping at the shore...but I knew that was impossible, we were in a village high in the mountains and the sea, miles away. I ignored it, although it persisted now and again. Nyoman nudged me and handed me a canang sari, one of the beautiful flower offerings his wife had created for us at dawn this morning. I placed it on the veranda in front of me and the men did likewise. He lit six incense sticks and gave one to each of us. I propped the incense stick into a palm leaf edge of the canang sari and prepared to pray along with the men and Jero Gede. One by one, we lifted a flower to our mouths, each blossom a separate prayer and an offering whispered to the gods, to the ancestors. At the conclusion of each prayer, we flicked the flower forward. It is believed that the flower, at this point in time, contains the essence of the prayer. Its movement through the air stimulates every particle throughout space with its message, continuing forever like a ripple to the stars. Each of us continued prayers in this manner until all the flowers except two were offered. The last two we placed behind our ears, a red flower on the right, a white flower on the left. This gesture signifies that the blessings have now been returned to us locked within our beings, and penetrate our minds thereby being expressed in our future actions. Behind the gild doors, Jero Gede was silent, and I opened my eyes. It was a gorgeous sight, white frangipani, indigo, vermilion, magenta and tangerine bougainvillea, yellow trumpets and brilliant red hibiscus were strewn across the veranda as if floating effortlessly on a black marble sea amid a fog of swirling incense. Sunlight creeped through their delicate translucent petals and their sweet blended fragrances created a delicate perfume in the air. Once again, the gild doors opened, Jero Gede emerged from the interior darkness shrouded in incense smoke. In front of his face, he held a strange somewhat round large object, whorled like tree bark or an ancient gnarled stump, the color of dried palm leaves or a shaved coconut. It covered his entire face like an unidentifiable tribal mask whose spirit was alive within its wearer's being. It had one hole, shaped and positioned similar to an eye socket on a skull and Jero Gede's eye peered through it directly at me with a forceful piercing stare. I could actually feel a warmness like a round ball moving slowly inside my head going down toward my chest. It was a very peculiar sensation, not uncomfortable, but definitely foreign. It seemed to hover around the area of my chest. At this moment, I became aware also that my legs were asleep. Not surprising, as I had been kneeling without moving since we arrived on the veranda quite some time ago by this point. I tried to ignore the mounting pins and needles sensation, alas in vain. Between the pricking legs and the peculiar warmness in my chest, I became more distressed by the moment. Jero Gede spoke quickly in a tone punctuated with authority. Nyoman whispered, "Dona, Jero Gede said you are not relaxed. It is very important for you to be relaxed." He paused for a moment, as so many times in the past he intuitively grasped the situation, and whispered, "It is okay for you to move into a better position, please sit well, you do not have to kneel, if it is good for you in another way." Relieved that neither kneeling nor moving around would be construed as improper or offensive within a sacred area, I repositioned myself, pleased to once again feel blood rolling through my veins. The peculiar warm sensation returned and seemed to localize near my stomach where it rather radiated through my body. I began to perspire from head to toe. Meanwhile, Jero Gede spoke at length, his voice eerily muffled behind the strange round object, in a soft almost musical intonation. Every so often Nyoman interjected and the sound of paper rustling told me he was writing everything down. Suddenly, Jero Gede's voice deepened to a low bass-like pitch, the syllables slow and pedantic like a tymphony drum. I sat and watched his unblinking one eye peer through the strange round object at me. The scenario continued in the same manner for quite some time, then abruptly the heat within my body disappeared, in its wake I felt clear and refreshed as if I just finished bathing in a cool mountain spring. Jero Gede stepped away from the doorway for a moment and reappeared without the strange round object. With lithe, supple movements he practically glided down the narrow steps, across the veranda, gingerly side-stepping the flowers, stopped in front of me and spoke very softly and gently. Nyoman nudged me and whispered, "Jero Gede said that the Dewas and your ancestors wish to bless you with a special gift. It will help prepare you for your spiritual journey. Please place your hands in the nunas position to receive it. 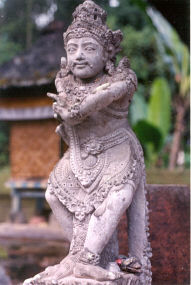 The nunas position is a Balinese gesture of ultimate, humble respect, used when receiving anything considered sacred or any object at all from a high priest (pedanda), as the pedanda himself is considered sacred, thus any object from him is also considered to be imbued with sacred energies. There are two positions, their usage determined by the circumstance. In one position, the left hand grasps the right elbow and the arm is extended cupped palm up. In the other position, both arms are extended, the left hand cupped underneath the right, palm up. It is a movement of one's body that both suggests and allows one to create a moment of reflection or focused awareness of the situation. It confers honor and esteem to the sacred essence of the object as well as respectfully recognizing the sacredness of the pedanda. Additionally, the left hand culturally in Bali is considered unclean at all times and is never extended to anyone at anytime, to do so is an act of extreme crude, vulgar and uncivilized behavior. I choose to extend both hands, the left cupped under the right, and bowed my head respectfully. Jero Gede pressed something into my palm. I looked, in the middle of my palm; glimmering in a ray of sunshine was a tiny ruby cabochon jewel. I closed my eyes... held it to my forehead for a few moments and... then swallowed it. Jero Gede pressed his hand to my forehead and held it for a few moments. I felt a zinging like a spritz of electricity through my forehead, down the length of my spine, tingling all the way. He laughed jovially and said, "ya, ya, ya." I turned slightly to exchange glances with my five friends, whose eyes were glued upon me, beaming with pride, with smiles of delight dancing across their faces. They knew Jero Gede had given me the ruby jewel and they considered that action to be an extraordinary accolade, a supreme blessing and a precious gift that indicated the Dewas approval not only of me as a person but also the crux of my journey. So did I. Even if I could speak the language at that moment, I still would have been speechless with awe, frozen in time and space on a black marble a sea of flowers. For a moment there was neither silence nor sound, cold nor heat, black nor white, sweet nor sour. Thoughts neither abandoned, nor sought. Nothing desired. Nothing possessed. Nothing required. No distance to travel, nothing ceased, nothing moved. The past had no content, the future no form, the present...eternity solidified. In the fluid stillness, I was there, just there and there was everywhere and nowhere, all at the same moment, all in the same breath.